Have you heard of riggis before? Whether you have or haven’t will largely depend on where you’re from, or at least where you’re family comes from. While I, like so many others, tend to think of the big city when someone says New York- the state’s actually extremely large, and just as varied culturally depending on the region. A traditional riggis pasta dish hails from Utica specifically. 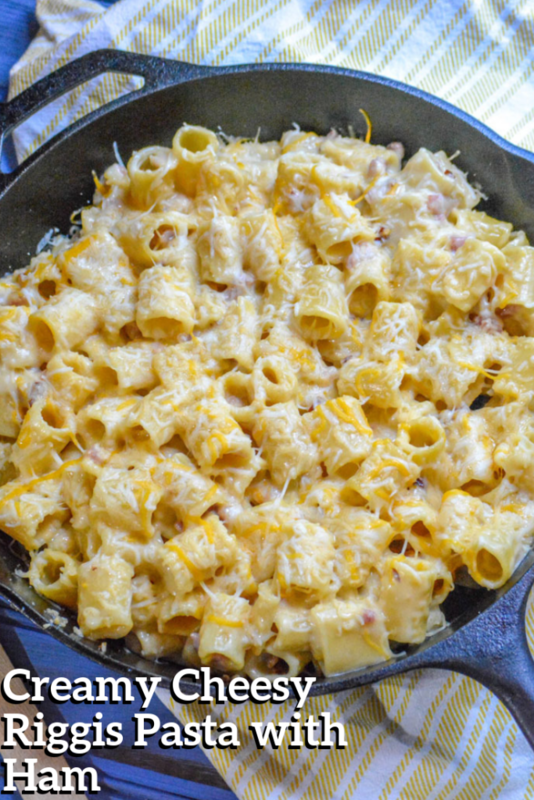 The traditional version has loads of tender rigatoni pasta tossed with savory sauce, and a good amount of cheese. I’m nothing if not known for going against the grain though. While my husband’s Italian family may not hail from that particular region, they settled in Pittsburgh, Pennslvania. However, once my in laws married- a work opportunity had them settling there for about a year, just long enough for my husband to actually have been born in New York instead of in the home state. Riggis were one of the things that they brought home with them, and have since passed on to us. I love a good saucy pasta dish as much as the next person, but sometimes I find myself getting board with the same combination of different pasta, tomato based sauce, and cheese. That’s saying something to, because this girl loves cheese. Like, we have our own special relationship. The family still wanted their riggis though. What was this Mama to do? Well, I kept the pasta, swapped the cheese, and went with a cream-based sauce instead. 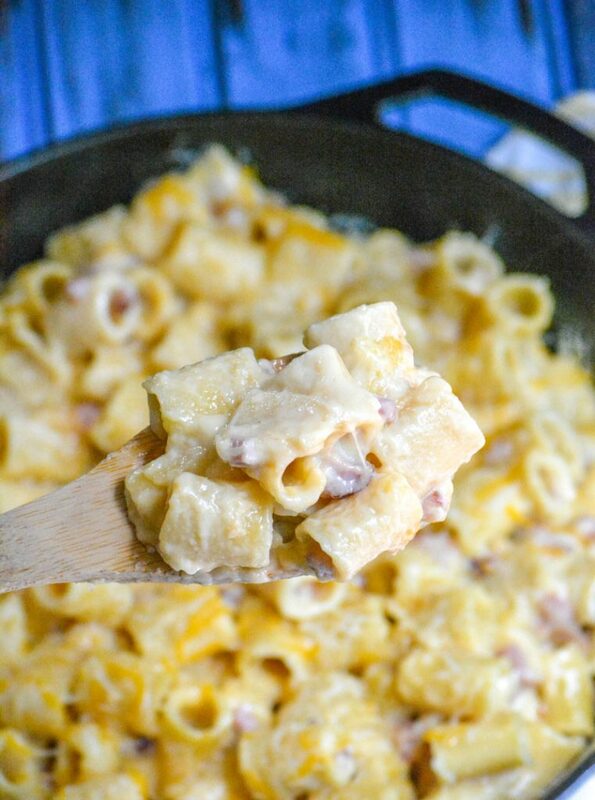 Greater things have been born from lesser decisions before, but this Creamy Cheesy Riggis Pasta with Ham certainly lived up to the idea I had in my head. And then some. 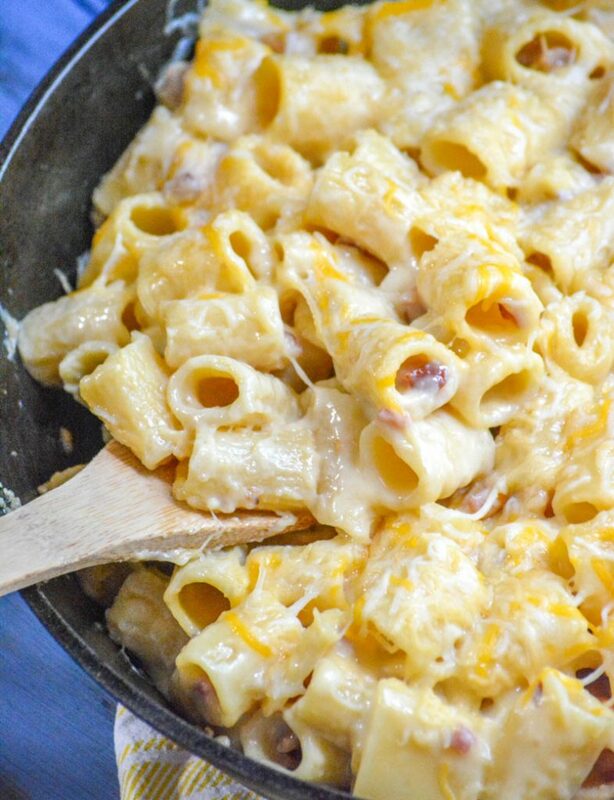 You start by melting a couple tablespoons of butter in a large skillet over medium high heat. To the hot butter, you add diced white onion-sauteing it until soft. Then you add in three teaspoons of garlic, sauteing just until fragrant. This only takes about 30 seconds of so, and make sure to stir it. Garlic can go from fragrant to burnt quickly, and nobody enjoys burnt garlic. That bitter taste is hard to forget. Chopped ham is stirred in next, and cooked until it’s hot too. Isn’t this shaping up to be something wonderful?! Pour in the stock and the half & half, stirring to evenly incorporate. Add in the pasta, stirring to combine. Salt and pepper the mixture, to taste. Bring the mixture to a rolling boil. Immediately reduce the heat to medium, and cover the pot. 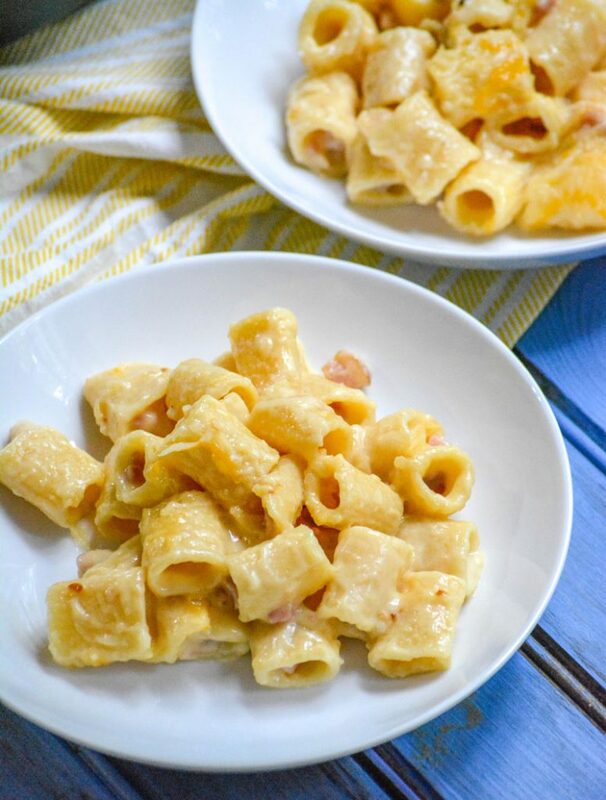 Continue to cook the riggis pasta with ham, stirring often to prevent the pasta from sticking & clumping, roughly 8-10 minutes- until the pasta’s tender. 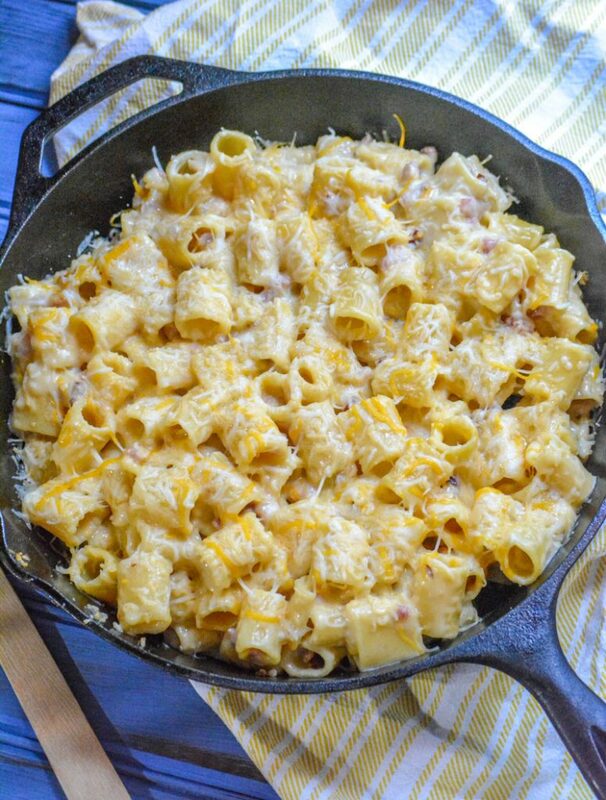 Remove the dish from heat, stir in the cheese, and serve immediately. 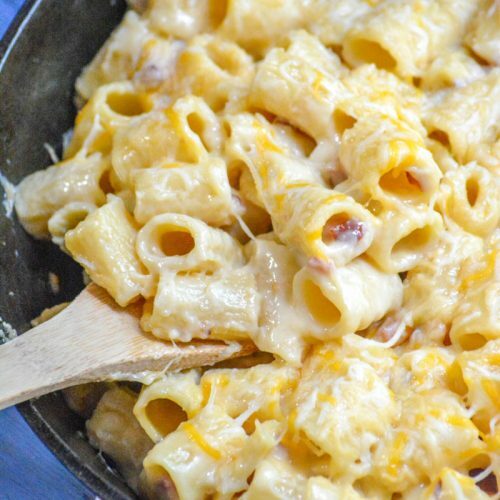 You can’t beat such a delicious, cheesy pasta dish in a cream sauce. 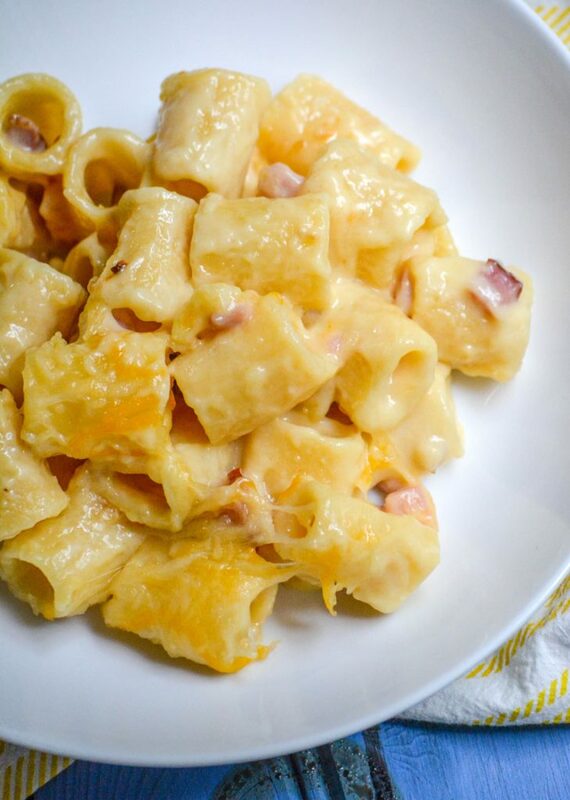 This riggis pasta with ham is really where it’s at. Perfect for lunch or dinner, it’s also a great addition to any potluck. Did you freeze ham leftover from Thanksgiving or Christmas? Planning to after Easter? This is one of those recipes you’ll want to bookmark to use them up later. 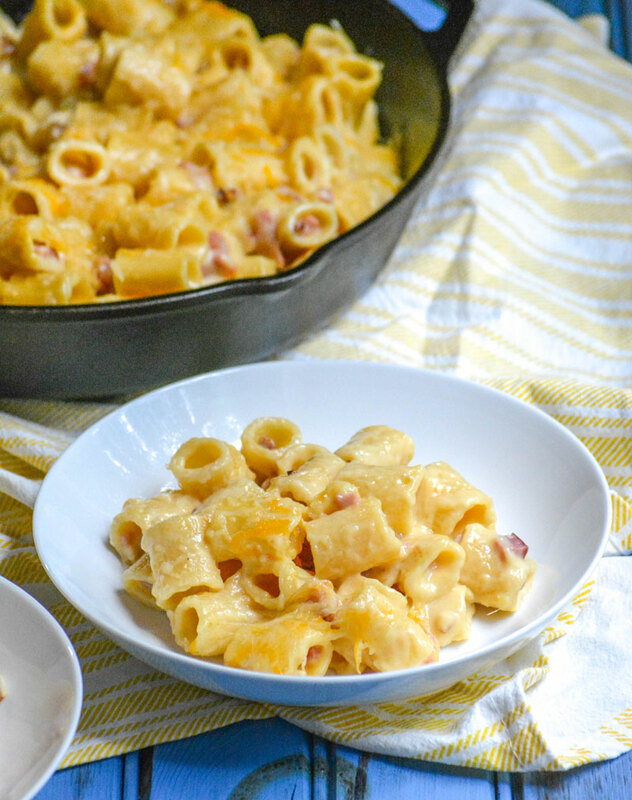 A cozy pasta dish perfect for all seasons, this one includes rigatoni pasta & chopped ham in a rich cream sauce with plenty of cheese. In a large skillet over medium high heat, melt the butter. Add the onions in and cook, stirring occasionally, until they soften- about 2-3 minutes. Stir in the garlic, cooking just until fragrant, about thirty seconds. Add the ham, cooking for another 30 seconds, just until it's nice and hot. Pour in the stock and half & half, stirring to combine. Stir in the pasta. Salt & pepper, to taste. Bring the liquid to a boil, reduce the heat to medium, cover the pot and cook until the pasta's tender and has absorbed most of the liquid- about 8-10 minutes. Make sure to stir the pasta occasionally so that it doesn't stick to the pot or to each other in clumps. Stir the cheese in, and serve immediately. Enjoy!